On our last day of packing up my uncle’s home at Mutijulu, we dropped some of the boxes off to a friend of his because the tow ball rating on Pete’s car, which we were using to cart a trailer-load full of gear back to Alice with, wasn’t strong enough to safely carry everything. Pete’s friend was another ranger. She and her husband helped us with the packing up job by taking quite a few loads of rubbish to the local dump, as well as offering to store and deliver some of his possession to him. Chatting with her before we left, we mentioned that we had a spare day and were thinking of walking around The Rock and then going to Kata Tjuta (the Olgas). “Women aren’t meant to go there”, she said. “Men’s business only. I don’t even look at it from a distance!”. Food for thought. I had been plenty of times as a child with my uncle, who ran plant walks though this area, but my husband had never been and felt a strong pull. We hadn’t found the time to visit them last time we came though, while on our first Wildflower Spirit Journey in 2012, so it felt very important not to miss the opportunity this time around. “Ok, I’ll sleep on it”, I replied. My conclusion (after sleeping on it), was to go. Unlike Pete’s friend, I have no Aboriginal blood in me, but neither can I just pretend to be a ‘dumb white tourist’. I grew up in Alice, have Aboriginal family, spent time in Mutijulu as a child, have painted for uncles and even been taught the odd story here and there. But as always, I am global, a spirit-child who belongs to the earth as a whole rather than to any one place or set of rules…. I cannot claim these laws as my own but I can, at the very least, show respect. I handed myself over and asked Spirit to guide me and ensure I conducted myself in the most respectful way possible. One very strong feeling I had was that this was Stephen’s journey, but I knew he wouldn’t go on his own without me. As an old childhood friend of Kata Tjuta, I would deliver Stephen there, to facilitate a connection for him. We woke before dawn that day and drove to The Rock. It was lovely seeing her dark silhouette in the early light of day as we approached. We drove around her slowly, bypassed the more popular tourist places and went to the place Peter had taken us to a few years earlier. I had my camera with me and was just about hopping with excitement about the possibility of finding new (and old) flower friends. We ate a bit more food, loaded up with water, grabbed our hats and set out. 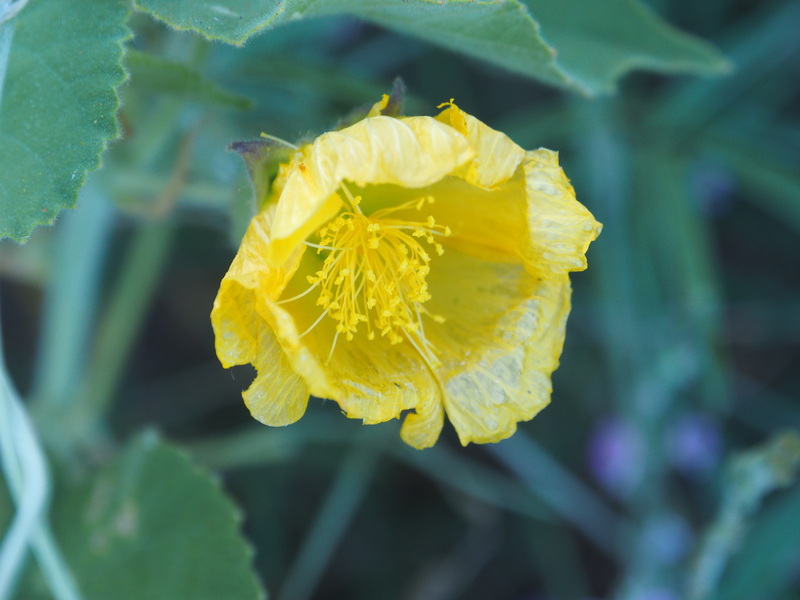 With me stopping to photograph flowers along the way, the 11.6 km walk took us over three hours, . We also explored some of the caves that were open to the public. I kept having childhood memories popping up about a special place we used to visit, but mum tells me this area isn’t open to the public any more. And there was one particular cave that ‘spoke’ to me. I’m starting to gather a bit of history with caves. I had a really powerful experience in one at Vanuatu and also in Kakadu, which I am writing about now in my second Wildflower Spirit book. Anyway, back to the Uluru cave! The cave kind of sucked me in, pulling my energy towards it and making my entire body tingle. I have photos, but when negotiating with Spirit about the writing of this story, we agreed I would not include photographs of the cave or of the place we visited at Kata Tjuta. “We’ll let you know”, said the cave. And on we went! 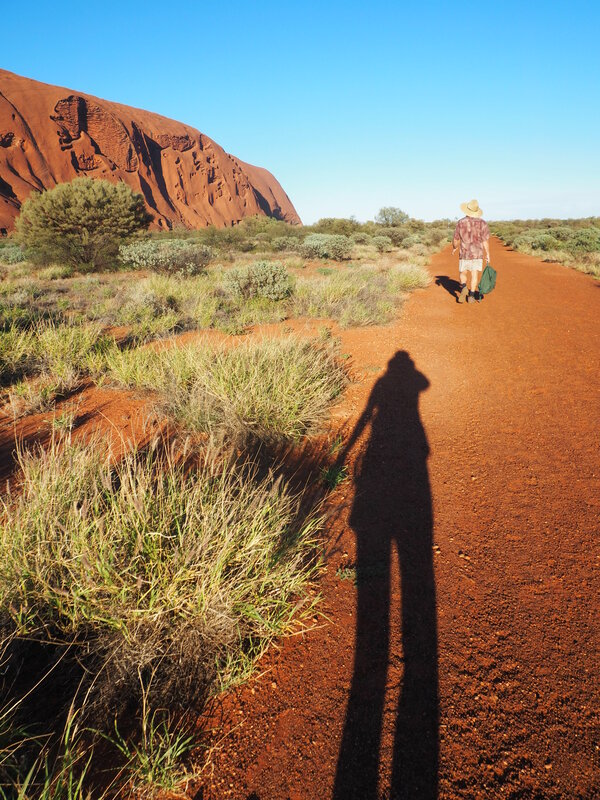 After completing the walk around Uluru, we headed out to Kata Tjuta. On the drive out there, my husband was worried about running out of fuel because it was further away than he had thought, which is kind of funny because he had experienced the same worries driving from Alice to The Rock. He was using Pete’s car, which can do the trip on one tank even with an A-van being towed behind, but the storage trailer created a lot of wind drag compared to the caravan, which folds up like a portable dolls house. “I’m in a cave. I’m sitting beneath a very low overhanging with two clear quartz crystals in front of me; one off to my left, one to the right, triangulating with my own position. Within this triangular space there is a vertical cocoon-shaped web of light off to my right-hand side. I go to step towards it but they say “No, it’s not ready yet”. I can see more fibres of light being woven into the cocoon, and I feel Spirit on the right side of my body, pushing me forcibly to the left. When I’m finally in the correct position, I hear/feel a sound coming up from the earth below. The sound flows up through the right side of my body. It’s re-tuning me. They (Spirit) are turning me to face the vertical cocoon. Light entering the cave is shining on the crystals and refracting. A beam of light bursts from each crystal and shoots towards the top of the cocoon. The light-beams seem to be creating a star-like shape on top of the cocoon and I can feel my crown chakra tingling. I feel light zag-zagging down from my crown chakra, bouncing off my inside edges and pouring into my solar plexus. The light is weaving a beautiful pattern between my solar plexus chakra and my heart chakra. Now I can see the desert lantern flower, which is scattered around the base of Uluru. I feel as though I am blooming and being stripped back. ‘Pared’, is the word that comes to mind. Something is pushing out of my right shoulder. It look like some kind of a grappling hook. I’m shooting it into the sun. I can feel a circle pattern or mandala of different beings or aspects of myself doing the same thing, one after the other like a Mexican wave, each shooting a grappling hook from their right shoulder into the sun. Now I am stepping into the cocoon of light that was created for me earlier in the cave. I have a strange spiralling feeling inside me, going down into the earth. (At this point in the recording, I start singing. No words, just sounds. This is tied in with Kata Tjuta but I have been asked to be vague!) I have a beautiful feeling of being Kata Tjuta itself, laying back and looking up at the sky, with the clouds caressing me softly, and then suddenly there is a flow of energy between Stephen and I. I feel like I am aligning with him and accessing his male energy. I am standing in front of him as though I am his mirror, and copying his movements. When we arrived at Kata Tjuta we found a sign explaining that this was a special place for men, but women and children were allowed to come here to get food and for shelter. That made me feel a lot better, but I still took special care to walk in my husband’s shadow and footsteps. I let him take the lead and could feel my inner child having a a lot of fun with the ‘following game’. There were moments when my natural independence came to the fore and I pulled alongside him, wanting to head in a different direction or go off exploring, but I resisted the temptation and stayed behind him. When he pointed out strange shapes, colours and ‘footprints’ in the rocks I looked carefully, knowing that what he was seeing was very important. I really enjoyed the beautiful experiencing of resting into yin energy and walking in Stephen’s shadow and Stephen loved the novelty of it too. It was lovely to soften and yield; to let his shadow guide, carry and teach me.